Appa is a two year old Havanese puppy (our kids named her after the flying bison in Avatar: The Last Airbender cartoon, the best cartoon ever.) Lately she has to be wherever I am. She is the first small dog we ever had. Sometimes acts as though she’s part cat. I have a little area in the sun room to draw in. I’m sorting out pages while I’m drawing and spreading out on the floor a bit, making a little mess. Appa found my drawings and thought it was a great bed. It was funny and cute for like two seconds. But I was sitting there actively sorting them when she came in and plopped down. Then she started rolling on them and digging them like she was settling down for the night. I didn’t take any more photos because the room immediately turned into flying papers, ripped papers, and chaos. This is two seconds before she starts tearing up the room. Time to set up a temporary table! 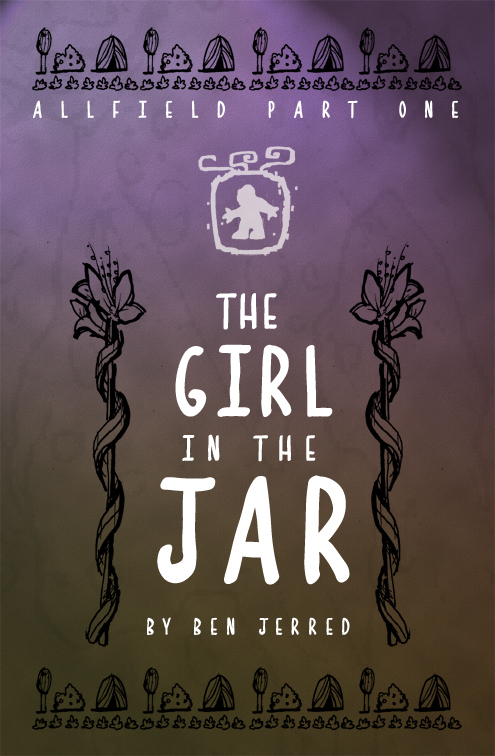 The Girl in the Jar is a full-length, full-color graphic novel by Ben Jerred. It is part 1 of the Allfield Series, where Allfield is the name of the imaginary world where the stories take place. This installment introduces us to DOK-the Struggle. Little Lada’s life is a string of disasters until she discovers a way to take control of her fate. She quickly discovers her choices have permanent and far-reaching effects on her world. THE GIRL IN THE JAR’s story does not start at the beginning of the world, but with a question: Who are we, and where do we come from? This is the story of people emerging from a dark age. Turning away from their everyday lives, they start looking for bigger answers buried beneath their feet. Here is about 15 pages of sneak peek content of the Girl in the Jar book. You’ll see glimpses of characters like Gane, Loja, and Wai. This is the original sneak preview, and coming soon will be replaced by the newest preview. If you are interested in this or have any questions, then please let me know in comments or on my contact page. 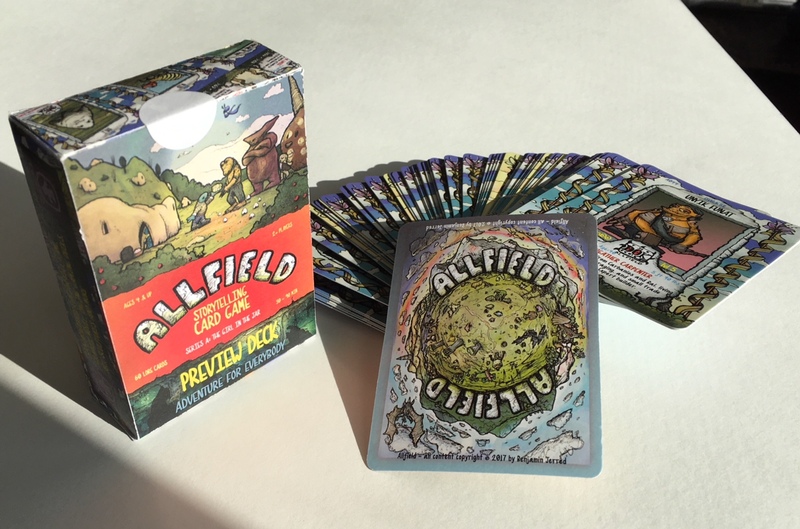 There is also an Allfield Storytelling Card Game with 300 unique cards coming soon. Here on the site you can read the directions so you can play as well. Coming soon will also be an interactive online database of Allfield characters, locations, maps, and information. If you’re an online RPG player, digital assets for online sites like Roll20 or Tabletop Simulator will also be available. You can now download a free black and white Print and Play with 60 preview cards, or find out how you can get an actual limited edition Review Deck to help spread the word about the full game’s upcoming release. As it gets closer to the full release, handmade physical Allfield artifacts will also be available in the shop.